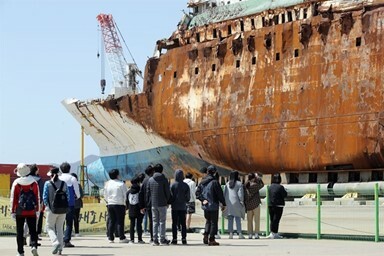 http://www.hankookilbo.com/News/Npath/201902071735732185 URL을 길게 누르면 복사할 수 있습니다. (서울=연합뉴스) 31일 국회에서 열린 더불어민주당 정책조정회의에 홍영표 원내대표(오른쪽) 등 참석자들이 굳은 표정으로 참석해 있다. Any act of manipulating public opinion is a serious crime. So anyone involved in such a crime should be subject to harsh punishment. Any type of opinion rigging poses a grave threat to democracy. 여론을 조작하는 어떠한 행위도 중대한 범죄다. 따라서 이런 범죄에 연루된 자는 누구든 엄중한 처벌을 받아야 한다. 어떤 형태든 여론 조작은 민주주의에 대한 심각한 위협이다. 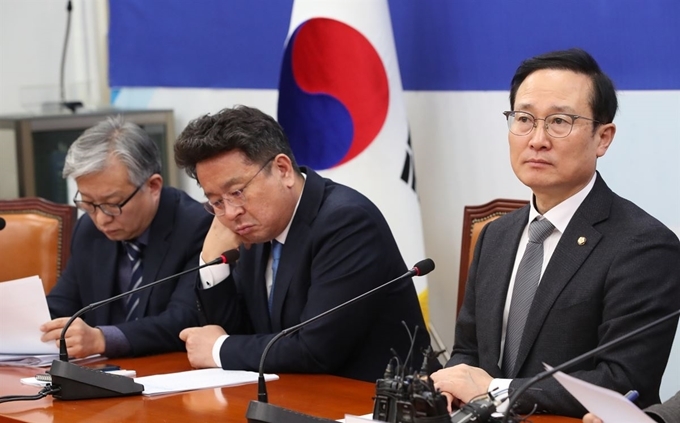 A case in point is a massive opinion manipulation scheme involving South Gyeongsang Province Governor Kim Kyoung-soo, a close confidant of President Moon Jae-in. On Wednesday, the Seoul Central District Court sentenced him to two years in prison for colluding with a power blogger in rigging comments on internet news articles in favor of Moon in the lead-up to the May 2017 presidential election. 문재인 대통령의 측근인 김경수 경남지사가 연루된 거대 여론 조작 사건은 좋은 일례다. 수요일 서울중앙지방법원은 2017년 5월 대통령선거 전 파워블로거와 공모하여 문 대통령에게 유리하게 인터넷 뉴스 댓글을 조작한 혐의로 김 지사에게 징역 2년을 선고했다. The ruling against Kim and the blogger, better known by his nickname Druking, is a stern warning against any attempt to tamper with public opinion. In this sense, we should respect the ruling although some people are against it for some reasons. 김 지사와 드루킹이란 별명으로 더 잘 알려진 이 블로거에 대한 유죄 판결은 여론 조작시도에 대한 엄중한 경고다. 이런 의미에서, 몇몇 사람들이 어떤 이유로 이 판결에 반대할 지라도 우리는 이 판결을 존중해야 한다. Now what is shocking is not the guilty verdict itself, but the ruling party’s reckless and nonsensical reaction to the court action. The Democratic Party of Korea (DPK) has virtually declared disobedience to the ruling against Kim who is affiliated with the party. 지금 놀라운 것은 유죄 판결 자체가 아니라, 법원의 결정에 대한 여당의 무모하고 터무니없는 반응이다. 민주당은 당원인 김 지사에 대한 판결에 대해 사실상 불복종을 선언했다. Even DPK lawmakers went to extremes to frame the court decision as retaliation by corrupt judges accused of abusing judicial power under the leadership of former Chief Justice Yang Sung-tae. Yang was arrested last week on charges of abuse of his authority under the rule of ousted President Park Geun-hye. 심지어 민주당 의원들은 양승태 전 대법원장 하에서 사법권 남용으로 비난 받아온 부패 법관들에 의한 보복으로 이 판결을 몰아가려고 극단으로 치달았다. 양 전 대법원장은 권좌에서 축출된 박근혜 전 대통령 통치 하에서 사법권을 남용한 혐의로 지난주 구속됐다. DPK floor leader Rep. Hong Young-pyo is leading the protest against the ruling to save Gov. Kim. But he went too far in denouncing the court for what he said was a systematic resistance from evils accumulated in the judiciary under Yang. 민주당 홍영표 원내대표는 김 지사를 구하기 위해 그의 판결에 대한 항의를 주도하고 있다. 그러나 홍 원내대표는 양 전 대법원장 시절의 적폐 세력으로부터의 조직적인 저항이라고 말하며 법원을 비난하는 데 있어 너무 도가 지나쳤다. Some other party members even floated the idea of impeaching presiding judge Sung Chang-ho and other judges for handing down the prison term for Kim. It is ridiculous for them to talk about the impeachment. Lawmakers should not be in a position to decide if a court ruling is fair or not. 몇몇 다른 당원들은 심지어 김 지사에게 징역형을 내린 성창호 부장판사와 다른 판사들을 탄핵하겠다는 생각까지 내놓았다. 이 당원들이 탄핵에 관해 이야기하는 것은 말도 안 되는 것이다. 국회의원들은 법원 판결이 공정한지 아닌지를 결정할 위치에 있지 않다. In this regard, the DPK and its members cannot avoid criticism for undermining the firm democratic principle: the separation of three powers of the legislative, judiciary and executive branches. They has also shown flagrant disregard for the due process of law and the right to a fair trial. 이와 관련 민주당과 당원들은 입법부, 사법부, 행정부의 3권 분립이란 확고한 민주주의 원칙을 훼손한 것에 대한 비난을 피할 수가 없다. 그들은 또한 정당한 법 절차와 공정한 재판권을 명백히 무시했다. They should realize their acts pose a serious challenge not only to the criminal justice system, but also to the democratic system of the nation. It defies both common sense and legal logic to stigmatize judge Sung as one of the “old evils” just because he once served as secretary of Yang. 그들은 그들의 행위가 형사 사법 제도뿐 아니라 우리나라의 민주주의 체제에 대한 심각한 도전이라는 사실을 깨달아야 한다. 단지 성 판사가 양 전 대법원장의 비서로 일했다는 이유만으로 그를 ‘적폐’의 일원으로 낙인 찍는 것은 상식과 법리 모두를 거역하는 것이다. In fact, Sung deserves credit for making rulings in a fair and objective way. He sentenced former President Park to eight years in prison for illegally accepting funds from the National Intelligence Service and interfering in nominations of candidates for general elections. 사실 양 판사는 공정하고 객관적으로 판결을 해왔다고 칭찬 받을 만하다. 그는 국정원으로부터 불법 자금을 수수하고 총선에 출마할 후보자 공천에 개입한 혐의로 박 전 대통령에게 8년형을 선고했다. We urge the governing party and its legislators to stop their attempts to put the judiciary’s political neutrality and independence at risk. They had better wait for higher courts to uphold or reject the district court ruling as Gov. Kim has already decided to appeal. Let the judiciary do its job. 우리는 여당과 국회의원들에게 사법부의 정치적 중립성과 독립성을 해치려는 시도를 중단할 것을 촉구한다. 그들은 김 지사가 이미 항소를 결정했기에 고등법원과 대법원 등 상위 법원이 지방법원 판결을 유지 또는 기각할지를 기다려보는 것이 더 낫다. 사법부가 결정을 내리게 내버려 두자.